Fockele Garden Co. designed and built the Pope Family Garden in a courtyard at Northeast Georgia Medical Center. 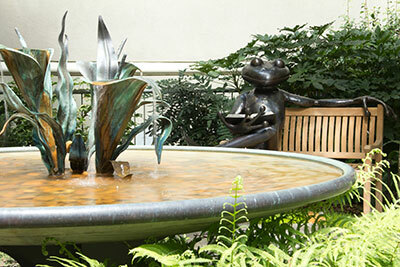 The garden features a human-sized frog that sits on a bench a few feet away from a small wooden book box in the shape of a house that serves as a children’s library. Located near the hospital’s Women and Children’s Pavilion, the therapeutic garden features a centerpiece fountain of sculptured calla lilies, a wooden book box which serves as a children’s library, animal sculptures and benches, tables and chairs for adults and children. The garden’s 40-foot magnolia trees were planted by The Fockele Garden Co. during the construction phase, while most of the garden details were still conceptual. Kubota Tractor Corp. will donate $1 million dollars in funds and equipment to the Hurricane Harvey relief effort. This donation will help provide the people of Aransas County and surrounding areas with the equipment and tools they need to help clear debris and expand efforts to rebuild businesses, homes and communities. 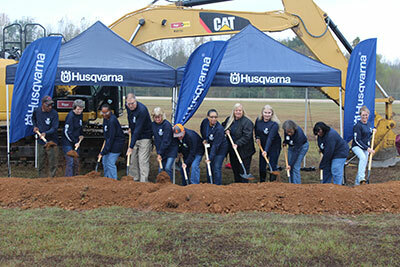 Husqvarna is expanding its operations in Nashville, Ark., with the construction of a new 350,300-square-foot distribution center and materials warehouse facility. The facility will serve primarily as warehouse, staging and storage, and will be located adjacent to the current manufacturing facilities in Nashville where chainsaws, trimmers, blowers, pole saws and hedge trimmers are made for the Husqvarna, Poulan Pro, Jonsered, McCulloch and Weed Eater brands. The investment includes an adjacent four-acre site to be used as a trailer court. Once the new facility is operational, the company’s manufacturing, warehousing and distribution footprint in Nashville will exceed 874,000 square feet. The new facility is projected to be fully operational by the end of 2018.